Frequency control has gone up ten-fold in cost since 2012. Data AER. ‘System’ and ‘reliability’ were once synonymous with Australia’s power grid. Not so, anymore, thanks to chaotically intermittent wind and solar. In another “don’t say we told you so” moment, the lunatics that have taken charge of the Australian Energy Market Commission have been forced to concede that the so-called ‘transition’ to an all wind and sun powered future isn’t going quite to plan. Indeed, every time the sun sets and/or calm weather sets in, the grid manager’s task becomes like that of a neurotic magician: stalked by fear, driven by anxiety, avoiding a total grid collapse is now more art than science. 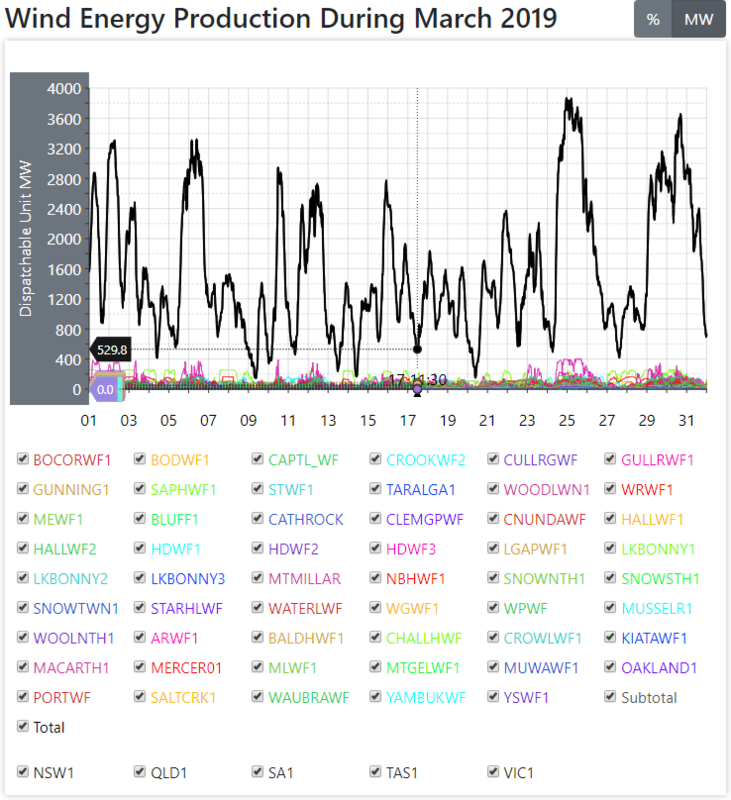 Balancing frequency and voltage is now a daily nightmare, thanks to large volumes of intermittent wind and solar. In the article below note the phrase “market interventions”, which sounds a bit like teacher scolding an unruly class. However, what’s really in play involves the market operator directing conventional, dispatchable generators (primarily coal and gas) to have their plants running – literally full steam – even though they are not dispatching electricity. That honour goes to heavily subsidised wind and solar, which, thanks to the $billions in RECs they receive and hand on to retailers, can readily underbid conventional generators when the sun is up and the wind is blowing. As far as sound commercial bargaining goes, it’s a bit like getting your taxi driver to wait outside your home all day – with the engine running – on the basis that, at some stage, you might choose to jump on board and pay the fare to the airport or wherever. The owners of conventional power plants are being forced to burn fuel and incur other operating costs, without the ability to dispatch electricity and earn revenue from doing so. Instead, they are now subject to “market interventions”, which involve cash payments to compensate those generators forced to run their plants in the background, ready to throw power into the grid with a heartbeat’s notice, as wind or solar power output plummets, every day. As Perry Williams details, the cost of these market inventions is staggering, growing and the cost and number of them can only get worse (see above). Oh, and if you think the article relates to Venezuela, no the story is all about Australia, once regarded as an energy superpower. Australia’s electricity grid is relying on emergency safety nets to keep the lights on, amid revelations the energy market operator stepped in more than 100 times last year to order South Australia’s gas generators to provide supply. This has prompted the nation’s energy rule maker to launch an investigation as the transition to renewables from coal ratchets up costs and places “extraordinary pressures” on the power system. SA’s electricity system is increasingly operating under the direct intervention of the grid operator, with last-ditch interventions reserved for emergencies becoming a default way of managing the network, as slabs of solar generation test the system’s strength, the Australian Energy Market Commission will warn today. The deterioration of the strength of the electricity network — most pronounced in South Australia — is also spreading to southwest NSW, northwest Victoria and north Queensland, adding to wholesale costs incurred by users. “The power system is experiencing more stress as it transitions to more renewables,” AEMC chief executive Anne Pearson writes in The Australian today. “Systems with lots of non-synchronous generation like wind and solar are weaker and harder to control — raising the risk of cascading blackouts. Unprecedented in their breadth and scope, these trends put extraordinary pressure on the security and reliability of our power grid.” Investment in large-scale renewable energy doubled in 2018 to $20 billion, with one in five Australians now owning rooftop solar and electricity generated by clean energy accounting for 21 per cent of the overall power mix, Clean Energy Council data will show today. 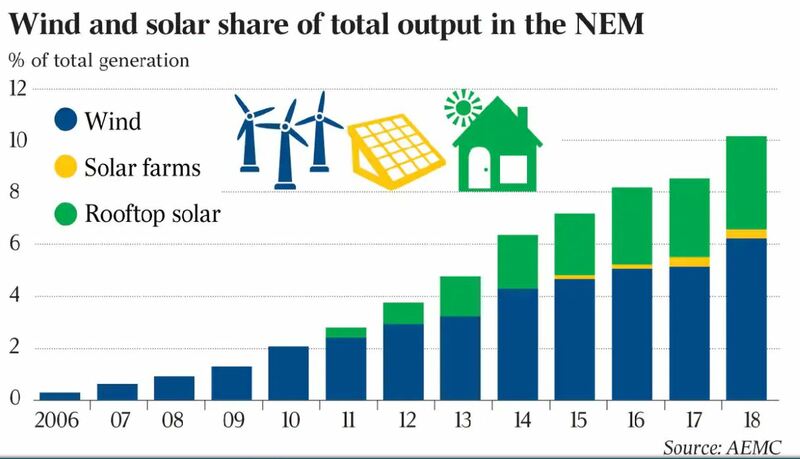 But the unprecedented surge in renewables has also upended the nation’s transmission system, much of which is decades old and was largely designed to cater for coal, which still supplies about 70 per cent of electricity in the system. Now thousands of smaller generators, including variable renewable supply, are connected to the grid, raising new pressures on the grid operator to ensure voltage and frequency — the nuts and bolts of a power system — are maintained to keep the lights on. The exit in 2017 of the Hazelwood coal-fired power plant in Victoria has contributed to network issues and unstable voltage in the state, while the impending retirement of facilities like AGL Energy’s Liddell unit in NSW also loom as pressure points for the system. South Australia required 100 separate interventions in the 2017-18 year for gas generators to provide supply and keep its system stable, compared with just eight in the previous year, Australian Energy Market Operator data provided to the AEMC shows. It appears to be a trend picking up pace, with South Australia’s generators in total receiving 210 directions since June 30, 2017, a number which the AEMC describes as an “unprecedented use of this intervention mechanism”. And for the first time last year, a Victorian generator was ordered to keep the lights on. That trend is also pressuring wholesale market prices, with the cost of keeping the system stable soaring to $270 million as of September 2018, while the cost of maintaining frequency control surged nearly tenfold to $220m in 2018 from $25m in 2012. The Reliability and Emergency Reserve Trader was also used twice, at a cost of $52m, in 2017-18 after never having been activated before — with costs paid by Victorian and South Australian businesses. “In the face of unprecedented change we see the power system still meeting consumers’ needs but only because the market operator, AEMO, is using the power system’s built-in safety-nets on a daily basis to keep the lights on,” the AEMC says. The AEMC said its findings have prompted it to undertake an extensive investigation of intervention mechanisms and system strength. “In the short term, the aim is to minimise the cost of directions and support lower-cost alternatives,” the AEMC says in its annual market performance review released today. The AEMC’s warnings underline the fast-changing nature of the grid, but may also be seized upon by political leaders as proof that more needs to be done to ensure the reliability and integrity of the electricity system. The Coalition has made lower power prices and system reliability two of the central planks of its energy policy in the lead-up to a May federal ­election, while Labor has pledged to deliver 50 per cent renewables in the nation’s power mix by 2030. One way to ensure the so called ‘renewable’s’ are stopped is for the the Federal and State Governments to take the plunge and create sensible Planning standards for these turbines. Because current Standards they are working with are so old and outdated and even when adopted were inadequate for the job cannot secure the safety of human health or the environment. And if you also consider turbines being proposed these days onshore are designed for offshore use you would think it ‘s sensible to expect our Governments to take action to prevent harm to the citizens of this Nation and the environment. As these turbines infest more and more of our lands and become bigger and bigger more and more people are going to find they cannot even travel across this nation. But then perhaps we are expecting too much of OUR Representatives, because they are all beholden to the powerful screeching of the ideological challenged and money grabbing National and International companies who believe they are the only ones OUR Representative represent. We are heading to a Federal Election, could we possibly hope we will get a Government willing to put the people before the ideology, to put the environment before the crass financial gaming of the ‘renewable’s’ industry – we can HOPE but it doesn’t look good for this country’s future no matter who wins. Until we have a Federal Government who can take charge of provision of this Essential Service, and take their role seriously to ensure energy is available when and where it is needed at a cost people can afford and that the production of it does not cause harm, and works toward the dismantling of these turbines to bring our Nations rural and regional areas back to the beautiful calm places they were, if they can’t then we might just as well sell up and move into the cities and leave our great regional and rural areas to the money hungry grabbers and ideological dysfunctional mob crying out to destroy our way of life. It’s up to us to pressure OUR Representatives to ensure they listen to us. AFTER ALL ISN’T IT THE ERA OF THE MINORITY WHO GAIN THE SUPPORT OF THE POLITICIANS IN PARLIAMENTS ACROSS THIS NATION, to ensure their needs are met!!!!!!!! What’s so different about those who want to live in rural and regional areas in peace and good health without the danger of having it destroyed and others who want to live their life as they wish without having to accept having their life and lifestyle brushed aside just because the ‘majority’ want something different. The dangers of the ‘renewable’s’ industry and its supporters is that it cannot prove it does no harm, it cannot prove it’s only interested in saving the earth, or that the environment is better off due to it’s existence. So why do Governments not control it why do they not ensure Standards are suitable, that no harm is being done and that it meets its claims of being able to provide our energy needs when and where it is needed at low cost to peoples pockets and the environment. WAKE UP AUSTRALIA and listen and look to what the environment is saying. Nothing has been gained anywhere in the world to ‘save’ the environment where these turbines have been erected. Potentially the public audience could be the greatest ensemble of snowflakes, pompous gits, spoilt brats, those with narcissistic personality disorders and the well heeled with their poodles ever seen on Australian shores. To those of you without a life be sure to tune in on “facebook live” on the Lighter Footprints FB page. Watch as the various candidates and the deluded slag off at Australia as being a racist country willing to sacrifice our grand children’s future by incinerating the planet. They don’t even rate the Big Fella a chance, I couldn’t give my money away, I took this as a personal kick in the guts. Then in a symbolic gesture as the coalition famously handed about a piece of coal in parliament, present it to Joshi Frydenberg and declare it to be the new Liberal party emblem. The media will love it, the faithful will be in raptures. You know Yoda its a great idea, its only pride that will stop you.Your only going to get one crack at the title Yoda, don’t leave anything in the change room. I imagine that the rent seekers will soon start pressuring Govts to extend the RE target beyond 2030 because of lead times etc and the fact they will need at least 15 years gauranteed returns or so they will say. No probs if Labor gets in of course but it seems the ONLY way to get stability a back into the system and reduce costs is to can the RET asap. Angus and Sco Mo need to keep focus on the issues that will affect working people and stop worrying about the ‘popular’ Green votes -if they even exist.There has to be a point where reality-and increasing blackouts must force the issue, but the real economic damage will have been done by then. Labor = Venezuela.